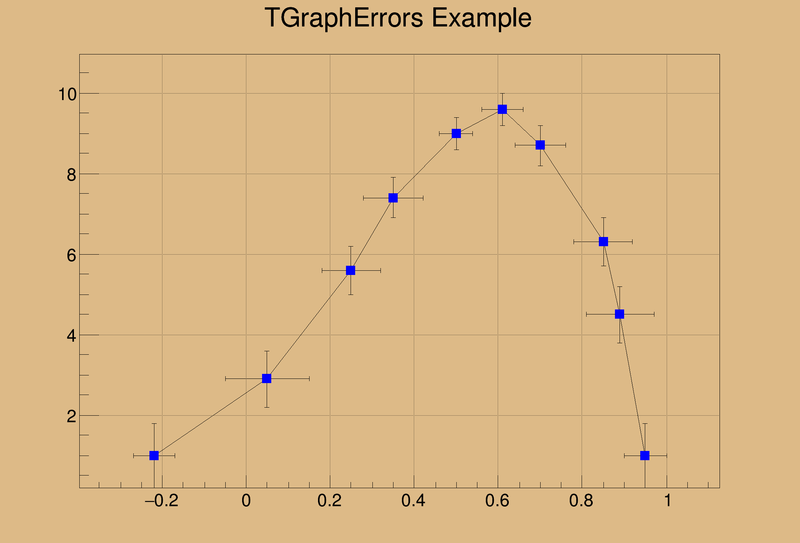 A TGraphErrors is a TGraph with error bars. The TGraphErrors painting is performed thanks to the TGraphPainter class. All details about the various painting options are given in this class. Definition at line 26 of file TGraphErrors.h. Definition at line 71 of file TGraphErrors.cxx. Definition at line 82 of file TGraphErrors.cxx. Definition at line 95 of file TGraphErrors.cxx. Definition at line 114 of file TGraphErrors.cxx. constructor with four vectors of floats in input A grapherrors is built with the X coordinates taken from vx and Y coord from vy and the errors from vectors vex and vey. The number of points in the graph is the minimum of number of points in vx and vy. Definition at line 134 of file TGraphErrors.cxx. constructor with four vectors of doubles in input A grapherrors is built with the X coordinates taken from vx and Y coord from vy and the errors from vectors vex and vey. Definition at line 154 of file TGraphErrors.cxx. Definition at line 170 of file TGraphErrors.cxx. TGraphErrors constructor importing its parameters from the TH1 object passed as argument. Definition at line 204 of file TGraphErrors.cxx. GraphErrors constructor reading input from filename filename is assumed to contain at least 2 columns of numbers. Convention for format (default="%lg %lg %lg %lg) - format = "lg lg" read only 2 first columns into X,Y - format = "lg lg lg" read only 3 first columns into X,Y and EY - format = "lg lg lg lg" read only 4 first columns into X,Y,EX,EY. For files separated by a specific delimiter different from ' ' and '' (e.g. ';' in csv files) you can avoid using %*s to bypass this delimiter by explicitly specify the "option" argument, e.g. option=" \t,;" for columns of figures separated by any of these characters (' ', '', ',', ';') used once (e.g. "1;1") or in a combined way (" 1;,;; 1"). Note in that case, the instantiation is about 2 times slower. In case a delimiter is specified, the format "%lg %lg %lg" will read X,Y,EX. Definition at line 232 of file TGraphErrors.cxx. Definition at line 367 of file TGraphErrors.cxx. Definition at line 77 of file TGraphErrors.h. For generic functions the symmetric errors might become non-symmetric and are averaged here. Use TGraphAsymmErrors if desired. Definition at line 387 of file TGraphErrors.cxx. Definition at line 410 of file TGraphErrors.cxx. Definition at line 441 of file TGraphErrors.cxx. Definition at line 471 of file TGraphErrors.cxx. Copy errors from fEX and fEY to arrays and arrays or to fX and fY. Definition at line 493 of file TGraphErrors.cxx. Definition at line 517 of file TGraphErrors.cxx. Definition at line 533 of file TGraphErrors.cxx. Set zero values for point arrays in the range [begin, end]. Definition at line 558 of file TGraphErrors.cxx. This function is called by GraphFitChisquare. It returns the error along X at point i. Definition at line 573 of file TGraphErrors.cxx. Definition at line 597 of file TGraphErrors.cxx. Definition at line 609 of file TGraphErrors.cxx. It returns the error along Y at point i. Definition at line 585 of file TGraphErrors.cxx. Definition at line 621 of file TGraphErrors.cxx. Definition at line 633 of file TGraphErrors.cxx. Definition at line 66 of file TGraphErrors.h. Definition at line 67 of file TGraphErrors.h. Adds all graphs with errors from the collection to this graph. Returns the total number of poins in the result or -1 in case of an error. Definition at line 644 of file TGraphErrors.cxx. Definition at line 184 of file TGraphErrors.cxx. Print graph and errors values. Definition at line 673 of file TGraphErrors.cxx. Save primitive as a C++ statement(s) on output stream out. Definition at line 684 of file TGraphErrors.cxx. Set ex and ey values for point pointed by the mouse. Definition at line 763 of file TGraphErrors.cxx. Set ex and ey values for point number i. Definition at line 791 of file TGraphErrors.cxx. Definition at line 846 of file TGraphErrors.cxx. Definition at line 29 of file TGraphErrors.h. Definition at line 30 of file TGraphErrors.h. ROOT 6.17/01 - Reference Guide Generated on Fri Apr 19 2019 04:54:55 (GVA Time) using Doxygen 1.8.14.